A new report indicates that we have got a major problem on our hands when it comes to saving the Earth. 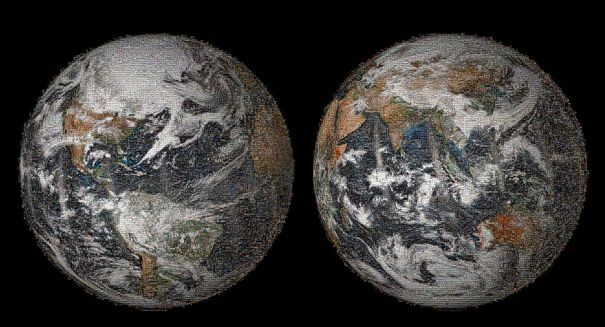 There’s a lot of problems we’re dealing with on the only planet we’ve ever called home, and a new report suggests we should get even more worried about what’s to become of Earth. The carbon dioxide concentration in the atmosphere last year surpassed 400 parts per million for the first time ever, according to the World Meteorological Organization. In WMO’s annual Greenhouse Gas Bulletin, which shows the ratio of CO2 to other gases in the atmosphere, indicates that the gas is rising by a huge rate, with the increase from 2014 to 2015 well above average. CO2 concentrations were 144 percent higher than levels before the industrial revolution, and methane and nitrous oxide levels have been shooting up too. Part of this increase is due to El Nino last winter, which resulted in droughts that choked forests, preventing them from soaking up carbon dioxide at their usual rates. But most of it is due to human activities, including using energy from fossil sources, growing population and increasing land use and deforestation. An excerpt from the report follows. In 2015, Earth experienced the start of a strong El Niño event. El Niño events are natural fluctuations of the climate system where unusually warm water accumulates in the equatorial Pacific Ocean. El Niño events are associated with abnormal weather patterns such as strong storms in some places and droughts or flooding in others. A typical El Niño event lasts 9 months to 2 years. This phenomenon is witnessed roughly every 2–7 years, although such a significant El Niño event had not occurred for the past 18 years. The figure at left shows the multivariate El Niño/Southern Oscillation (ENSO) index  that indicates the strength of the El Niño events. The largest El Niño events since 1950 are shown. The 2015/2016 El Niño was one of the eight strongest since 1950 and was associated with 16 consecutive months of record global temperatures . With the exception of the years following the eruption of Mt inatubo in 1991, there has been an increase in the growth rates of atmospheric carbon dioxide (CO2) following E Niño events (figure at right). The plot is based on the CO2 global growth rate as estimated from the National Oceanic and Atmospheric Administration (NOAA) global in situ network  with data starting in 1960. The periods with the seven largest El Niño events since 1960 are highlighted in blue. The CO2 growth rate calculated using observations from the WMO Global Atmosphere Watch (GAW) Programme is larger than the average of the last 10 years, despite evidence that global anthropogenic emissions remained essentially static between 2014 and 2015. According to the most recent data, increased growth rates have persisted far into 2016, consistent with the expected lag between CO2 growth and the ENSO index. It is predicted that because of this, 2016 will be the first year in which CO2 at the Mauna Loa Observatory remains above 400 ppm(1) all year, and hence for many generations . Despite the increasing emissions from fossil fuel energy, ocean and land biosphere still take up about half of the anthropogenic emissions . There is, however, potential that these sinks might become saturated, which will increase the fraction of emitted CO2 that stays in the atmosphere and thus may accelerate the CO2 atmospheric growth rate. During El Niño events, the uptake by land is usually decreased. As during the previous significant El Niño of 1997/1998, the increase in net emissions is likely due to increased drought in tropical regions, leading to less carbon uptake by vegetation and increased CO2 emissions from fires. According to the Global Fire Emissions Database , CO2 emissions in equatorial Asia were 0.34 PgC(2) in 2015 (average for the period 1997–2015 is 0.15 PgC). Other potential feedback can be expected from changes other than El Niño itself, but rather related to largescale sea-ice loss in the Arctic, the increase in inland droughts due to warming , permafrost melting and changes i the thermohaline ocean circulation of which El Niño is in fact a minor modulator.